The Conference Center at the Georgia Public Safety Training Center is perfect for large meetings, conventions, expos, and catered events of all kinds. 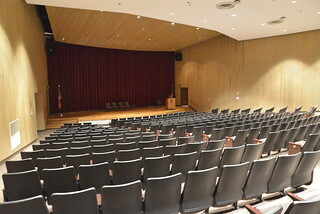 With three conference halls that can be combined as necessary for a capacity of up to 750, the Conference Center at GPSTC is one of the largest facilities of its kind in middle Georgia. Conference Center staff can assist you with all aspects of hosting meetings or events at GPSTC, from providing audio-visual support to planning for banquet needs. No outside catering is permitted on the GPSTC campus; all food/beverage needs must be coordinated through GPSTC. The entire Conference Center at GPSTC is Wi-Fi enabled. GPSTC’s Auditorium is perfect for large gatherings, ceremonies and seminars. It features theater-style seating for 500 and full audio-visual capabilities. The Auditorium is Wi-Fi enabled.